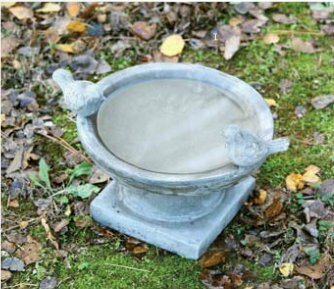 A cement bird bath is one of the most popular additions for your backyard birds. 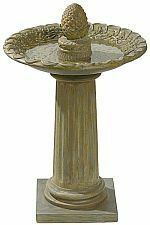 There are so many different designs and varieties of a these bird baths for you to choose from, that you are sure to find exactly what suits that special spot in your garden. One problem with cement baths is that they are prone to get grungy quite easily. Algae grows on the cement and can spread quickly. I find that it helps to refill the bath every couple of days. When doing so, give it a scrub down with Brillo or a brush. For a good clean - empty all of the water. Mix a solution of one part bleach to nine parts water. Wash the bird bath with this solution. You might need to leave it to soak for a few hours. Rinse very thouroghly. Allow to dry. Refill. Full sun is great for the birds BUT encourages algae growth. So choose a spot that has shade if you don't want to clean too often. Place away from trees and other plants that loose their leaves. Make sure it is sturdy and not able to fall over. Try and place away from bird feeders to minimise seed falling into the water. All birds love water! They need it for drinking, preening and bathing. So even if they do not choose your garden for the food, they will visit the bird bath. Any kind of bird bath will find favour with your garden birds, and give you endless hours of entertainment. The best depth for a bird bath is 1 - 3 inches deep. Deeper water is difficult for even large birds to drink from and bathe in. Make the water more accessible by adding a shallow dish to the middle of the bath, or use rocks to provide perches in the water. 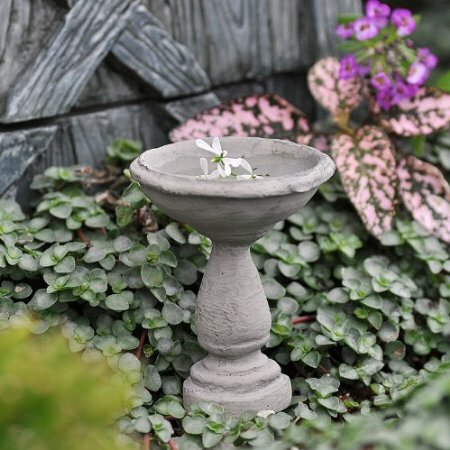 Try misters, drippers, fountains and ponds as ways to provide water for backyard birds and as a feature in your garden. Birds love a fountain! The noise of the water attracts them and the movement of the water keeps it aerated and clean. Have a look at the products below and have fun integrating them into your garden. A really gorgeous little bird bath! Add even more character to it with a floating flower. This little bird bath comes with a metal attachment to peg it into the garden. It is reasonably priced and durable. Although it holds a small amount of water, the birds love it. Can also be placed in a bigger pot. 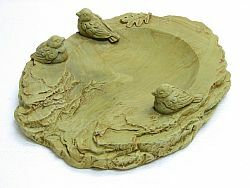 This cute bird bath can be used for water or for bird food. Place under the drain pipe to catch the rain water and watch your backyard birds have fun. If you get tired of using it in the garden, it makes a lovely indoor candy dish. It is dainty enough to place on your patio in amongst pot plants. 12 inches W and 9,5 inches high. Make your garden visitors happy with warm water in winter. Have a at look at my solar powered bird baths. Attract humming birds to your garden and prepared to be delighted! Choose a ground bird feeder to complement your bird bath.